Brian May conducted an interview with Classic Rock Magazine and Nicky Horne about Queen’s rebirth and on this post-Thanksgiving day, the headline is the only way I can think about this. 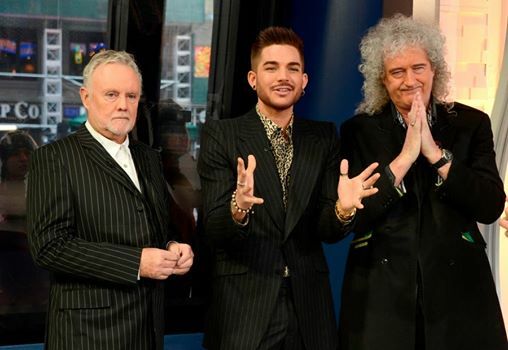 Every time I listen to Brian or Roger Taylor talking about Adam Lambert, my heart beams with pride and happiness, listening to the way they talk about him. I really believe Adam will continue with his solo career but will remain Queen’s choice for singer. Is there any doubt, after listening to this interview? You can find the interview here. We’ll post Part 2 soon! Every one of us Glamberts are giving thanks to Roger & Brian for seeing what a musical genius Adam Lambert is &putting him into the spotlight singing their music, it was an amazing win-win for everyone!!!!! I think we all give thanks for Adam! Yes we all give thanks for Adam, and this Queen tour has been the best medicine for all of us who want Adam to do well. I am still looking forward to his album. Wish he’d squeeze in a Christmas album at some point, wish he’d do a lot of things. But the Queen tour is the best thing ever. I’m glad Brian and Roger are so happy about it. When Adam first auditioned with Bohemian Rhapsody, I wanted him to finish the song, then appearing in the finally with Queen, completely overshadowing Chris Allen , I thought this was a match made in heaven. Then they sang together, and toured in Europe ! unbelievable. I’ve been to Adams concerts and when Queen announced the American tour, I booked 3 concerts. Now, even my husband is willing to travel to Krakow to see the again. Its not just their amazing musical ability, but its the chemistry on the stage that that really makes this band special. I hope they continue making beautiful music together for a very long time !! I am very happy for both Adam and Queen! I think Freddy would approve of Adam too! It’s really a good deal. Queen gets to continue with a wonderful performer. And Adam gets to perform with a great band. It is a win, win situation for both of them! And I know Adam is very flamboyant like Freddy. So this is a truly great deal for Adam and Queen. May God bless all of them and may this continue on as long as possible. Love you Adam. And I am so glad things are going so good for you!